The promises of precision medicine are to dramatically change patient care via individually tailored therapies and, as a result, to prevent disease, improve survival, and extend healthspan. The human genome project was undoubtedly a magnificent achievement, but has the investment in genomics delivered? There is an extended discussion on In the Pipeline https://blogs.sciencemag.org/pipeline/archives/2019/01/31/precision-medicine-real-soon-now. As mentioned on the Target Validation page, Open Targets is a public-private partnership that uses human genetics and genomics data for systematic drug target identification and prioritisation. The current focus is on oncology, immunology and neurodegeneration. An extension to this will be launched on 18 October 2018. Open Targets Genetics is a new portal developed by Open Targets, an innovative partnership that brings together expertise from six complementary institutions to systematically identify and prioritise targets from which safe and effective medicines can be developed. The Portal offers three unique features to help you discover new associations between genes, variants, and traits, Gene2Variant analysis pipeline, Fine mapping/ credible set analysis, UK Biobank + GWAS Catalog integration. Just announced. Open Targets Platform release - 18.08. Boehringer Ingelheim has added it's well-characterised non-covalent ATP-competitive inhibitor of glycogen synthase kinase (GSK-3) Bi-5521 to its open molecule platform opnMe.com. opnMe.com, the new open innovation portal of Boehringer Ingelheim, aims to accelerate research initiatives and enable new disease biology in areas of high unmet medical need by sharing well-characterized, best-in-class, pre-clinical tool compounds. 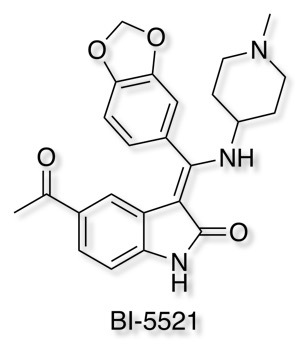 BI-5521 is a potent and selective ATP-competitive small molecule inhibitor of glycogen synthase kinase 3 (GSK-3), GSK-3β (IC50) 1.1 nM, with demonstrated in vivo activity. Rat pharmacokinetics are available, together with an inactive related compound. Another useful tool for Target Validation. How reliable is the literature? In the past I've mentioned some of the concerns about antibody selectivity, the problems with irreproducible studies and the need for well characterised chemical probes. Elisabeth Bik has been looking at concerns with some of the images in the published literature, The prevalence of inappropriate image duplication in biomedical research publications. mBio 7(3):e00809-16. DOI. her Twitter feed contains yet more examples from the current literature, well worth a browse. With all the advances in AI and image recognition I'm slightly disappointed that there is not a programme that can do this automatically for Elisabeth. We recently heard that Pfizer is leaving the neuroscience therapeutic area, with a resulting loss of around 300 jobs. This is of course bad news for the scientists involved but I hope the work that was undertaken within Pfizer does not disappear. Chemical probes are critical tools in target identification and validation and arguably even more so in neuroscience. I hope that Pfizer consider releasing some of the well characterised molecules as freely accessible chemical probes, especially if they could also offer a similar but inactive molecule as a negative control. Many of the older tool compounds reported in the literature have been shown to have inadequate selectivity which compromises understanding the biology. There are many important therapeutic targets within neuroscience but our biological understanding is currently inadequate to justify the investment in drug discovery, a selection of well characterised probes may provide the tools to support the necessary basic biological research. I've updated the Target Identification/Validation page in the Drug Discovery Resources. In particular I've added a section on the failure to reproduce literature experiments. Remember this is an absolutely critical step, almost everything else can be fixed. In 2011, an evaluation of 246 antibodies used in epigenetic studies found that one-quarter failed tests for specificity, meaning that they often bound to more than one target. Four antibodies were perfectly specific — but to the wrong target. The issue of antibody selectivity has again been flagged as a concern in oestrogen receptor beta research DOI. This is a major target for breast cancer research and there are multiple ongoing clinical trials https://clinicaltrials.gov/ct2/results?term=ERβ. We here perform a rigorous validation of 13 anti-ERβ antibodies, using well-characterized controls and a panel of validation methods. We conclude that only one antibody, the rarely used monoclonal PPZ0506, specifically targets ERβ in immunohistochemistry. Applying this antibody for protein expression profiling in 44 normal and 21 malignant human tissues, we detect ERβ protein in testis, ovary, lymphoid cells, granulosa cell tumours, and a subset of malignant melanoma and thyroid cancers. We do not find evidence of expression in normal or cancerous human breast. Perhaps more worryingly the authors comment. While our study focuses on ERβ, we do not think that antibodies towards ERβ are significantly poorer than those targeting other proteins, and it is not unlikely that this problem generates similar obstacles in many other fields. The reproducibility of some target identification/validation studies has been questioned on several occasions and I've flagged up some of the concerns in the Target Validation section of the Drug Discovery Resources. A recent study, reported in Science 28 August 2015: Vol. 349 no. 6251 DOI looking at psychological science, attempted to replicate published work suggests that 39% of effects replicated the original result. Also Amgen, tried to replicate 53 'landmark' cancer studies and failed to replicate the original studies in all but six occasions, Nature 483, 531–533 (29 March 2012) DOI. A while back a project was initiated to look at reproducibility in cancer, Science Forum: An open investigation of the reproducibility of cancer biology research DOI. It is widely believed that research that builds upon previously published findings has reproduced the original work. However, it is rare for researchers to perform or publish direct replications of existing results. The Reproducibility Project: Cancer Biology is an open investigation of reproducibility in preclinical cancer biology research. We have identified 50 high impact cancer biology articles published in the period 2010-2012, and plan to replicate a subset of experimental results from each article. A Registered Report detailing the proposed experimental designs and protocols for each subset of experiments will be peer reviewed and published prior to data collection. The results of these experiments will then be published in a Replication Study. The resulting open methodology and dataset will provide evidence about the reproducibility of high-impact results, and an opportunity to identify predictors of reproducibility. Well some of the early results are in and they make for pretty sobering if not unexpected reading, of the first 7 papers examined, 2 appear to reproduce the original finding to some extent, three show significant differences from the original studies. The results are published in eLife here and there is an editorial here DOI, and they make an important point. if all the original studies were reproducible, not all of them would be found to be reproducible, just based on chance. The experiments in the Reproducibility Project are typically powered to have an 80% probability of reproducing something that is true. The key question is of course, is the failure to reproduce these results due to methodological differences not apparent from the described experimental or whether the fundamental result is invalid. At the moment if you are planning to invest in a drug discovery project based on a single publication then Caveat emptor. A collection of 47 deprioritised pharmaceutical compounds and up to £5 million is being made available to academic researchers through the latest round of the MRC-Industry Asset Sharing Initiative. The collaboration, between the MRC and six global drug companies, is the largest of its kind in the world. The list of compounds is available here together with brief description of the molecular target and pharmacology, Safety, Tolerability and toxicity information, and any clinical studies that might have been undertaken. The Chemical Probes Portal has been updated, the new site includes a lot more data about the existing probes, reviewer ratings and their comments. A chemical probe is simply a reagent—a selective small-molecule modulator of a protein’s function—that allows the user to ask mechanistic and phenotypic questions about its molecular target in cell-based and/or animal studies. These are tools not drugs, they allow scientists to investigate the relationship between a molecular target and the broader biological consequences of modulating that target in cells or organisms. In general the focus is on specificity for the target rather than pharmacokinetics. A little while back I mentioned the Centre for Therapeutic Target Validation, well it seems that it has now been renamed Open Targets. The Target Validation platform brings together information on the relationships between potential drug targets and diseases. The core concept is to identify evidence of an association between a target and disease from various data types. A target can be a protein, protein complex or RNA molecule, but we integrate evidence through the gene that codes for the target. In the same way, we describe diseases through a structure of relationships called the Experimental Factor Ontology (EFO) that allows us to bring together evidence across different but related diseases. This is an absolutely invaluable resource for anyone involved in drug discovery, simply type your query into the text box and submit the query. This update also bring programmatic access to the data via a series of REST services, the API is fully documented. All the methods are available via a GET request and will serve the output formatted as json. There is a getting started tutorial available. There has been much discussion about the attrition of drugs in development due to lack of efficacy in man and this in part can be due to poor target validation. That is proof that modulation of the identified target in a model system has the desired impact on biological activity and can be linked to therapeutic utility. This is an absolutely critical step, almost everything else can be fixed. For this reason two new resources seem particularly valuable. The Centre for Therapeutic Target Validation platform (https://www.targetvalidation.org) brings together information on the relationships between potential drug targets and diseases. The core concept is to identify evidence of an association between a target and disease from various data types. A target can be a protein, protein complex or RNA molecule, but we integrate evidence through the gene that codes for the target. In the same way, we describe diseases through a structure of relationships called the Experimental Factor Ontology (EFO) that allows us to bring together evidence across different but related diseases.The platform supports workflows starting from either a target or disease and presents the evidence for target – disease associations in a number of ways through association and evidence pages. DisGeNET(http://www.disgenet.org/web/DisGeNET/menu/home) is a discovery platform integrating information on gene-disease associations (GDAs) from several public data sources and the literature doi. The current version contains (DisGeNET v3.0) contains 429111 associations, between 17181 genes and 14619 diseases, disorders and clinical or abnormal human phenotypes. A slightly worrying article in Nature, Reproducibility crisis: Blame it on the antibodies. The lack of reproducibility of published data on potential drug targets has been highlighted on several occasions DOI and it has been suggested that this is a major factor in the failure rate for phase 2 clinical trials DOI. In almost two-thirds of the projects, there were inconsistencies between published data and in-house data that either considerably prolonged the duration of the target validation process or, in most cases, resulted in termination of the projects. Antibodies have rapidly become a key tool in understanding and identifying new drug targets and potentially used as biomarkers to identify patients. However it is clear that many of the 2 million commercially available antibodies need to be checked rigorously, with some scientists claiming more than half are unreliable. In 2011, an evaluation4 of 246 antibodies used in epigenetic studies found that one-quarter failed tests for specificity, meaning that they often bound to more than one target. Four antibodies were perfectly specific — but to the wrong target. Target validation is the most critical step in drug discovery because as the chemists will tell you “Most of the other things we can fix”, so I was delighted to hear about the new Centre for Therapeutic Target Validation. I wish them every success and will be following their work closely.